Irish frog doll is embroidered with Kiss Me! I'm Irish; he would make a cute Irish baby gift. This Irish frog doll would make an ideal St. Patrick's Day decoration. 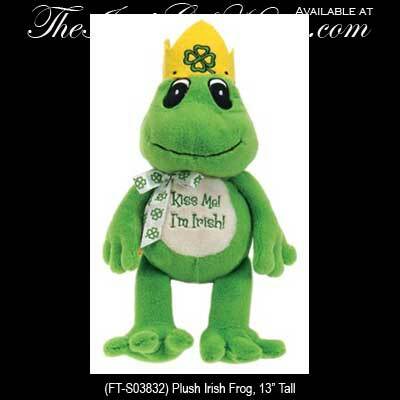 This plush Irish frog features clover ribbon on his neck along with a crown with a clover on his head. The stuffed green Irish frog from The Irish Gift House is embroidered with Kiss Me! I'm Irish on his tummy and stands 13" tall.